Best Pot Roast Recipe Ever! I love crock pot recipes. They are so easy to put together and perfect for Sunday lunches. I just love coming home from church with the whole house smelling of goodness knowing that something yummy will soon be on the table and I didn’t spend all morning slaving away to prepare it. That said, roast is definitely a favorite of my peas and potatoes home-cookin’ family…except for one fact–my family does NOT like Onion Soup Mix. I know…it’s hard to fathom but it’s true. It seems like every good pot roast recipe includes none other than a dry onion soup mix which left this mom searching for a tasty alternative. Right after our Teacup was born, one of my friends shared a pot roast with us. We loved how it tasted. It didn’t have that usual Dry Onion Soup Mix flavor and it was moist. We were sold. I wanted the recipe. That’s when her beloved secret was revealed. She didn’t have some earth-shattering recipe at all; her roast came prepackaged from the store seasoned that way. Left bummed without a new recipe, I went back to the drawing board only this time with renewed inspiration. The result is what you see below and we love it. 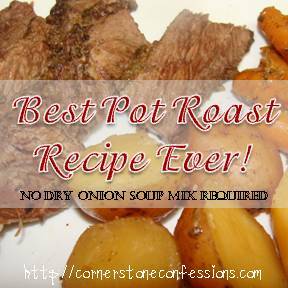 This roast still has a little minced onion in it but the flavor is not nearly as over-whelming as a onion soup mix making it a favorite for everyone in this family. Top that with the fact that the roast comes out tender every time no matter the size, and we’ve now vowed to never go back again. All that to say, if you are looking for a new pot roast recipe, give this one a try. It may just become your new favorite too! Enjoy! Place baby carrots and potatoes in the bottom of a large slow cooker. Place the roast on top of the potatoes and carrots. Mix the remaining ingredients together. Pour over the top of the roast. Cook on high 4-6 hours. Enjoy!